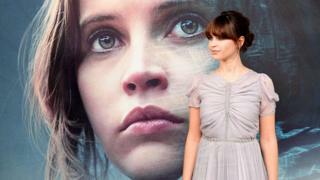 Film critics have praised the new Star Wars film Rogue One, starring Felicity Jones as Jyn Erso and directed by British filmmaker Gareth Edwards. It is set between the events of Episode III: Revenge of the Sith and the original Star Wars film, 1977's Episode IV: A New Hope. Rogue One: A Star Wars Story, the first of three standalone spin-off films, is released in the UK on Thursday. Many critics gave the film four stars out of five. Between epic battles featuring scores of familiar spaceships and the genuine thrill of hearing composer Michael Giacchino riff on John Williams' classic score, there's no denying that the film belongs to the creative universe [George] Lucas established. This is the rebellion as it is experienced in the trenches. Younger audiences will be bored, confused, or both. But for the original generation of Star Wars fans who weren't sure what to make of episodes one, two, and three, Rogue One is the prequel they've always wanted. This new entry in the series, stand-alone or not, earns solid middle-to-upper-middle standing in the overall franchise scheme of things. Whether we ever see any of these new characters again remains an open question; some would be welcome, others will not be missed. What fans will get here is loads of action, great effects, good comic relief, stunning locations (Iceland, Jordan and the Maldives) and some intriguing early glimpses of the Galactic Empire as it begins to flex its inter-galactic power. As always, a Star Wars movie lives or dies depending on how much we give a damn or don't about the characters. Luckily, there are no cutesy Ewoks to soften Jyn's journey into the heart of Imperial darkness. It's no lie that some of the interactions get lost under the weight of front-loaded exposition. But with the smashing Jones giving us a female warrior to rank with the great ones and a cast that knows how to keep it real even in a sci-fi fantasy, Rogue One proves itself a Star Wars story worth telling. Rogue One doesn't really go rogue at any stage, and it isn't a pop culture event like The Force Awakens, in whose slipstream this appears; part of its charm resides in the eerie, almost dreamlike effect of continually producing familiar elements, reshuffled and reconfigured, a reaching back to the past and hinting at a preordained future. There are some truly spectacular cameos from much-loved personae, involving next-level digital effects. Edwards' stint at the 2014 Godzilla reboot's helm makes him no stranger to earth-ripping set-pieces, and Rogue One's have been conceived and executed with serious dazzle and grace. But in its best moments, there's a yarn-spinning intimacy to it too - an old war story told around a spectacular campfire. Some of it's clumsy, some of it's great (watch out for some ingeniously repurposed archive footage from A New Hope). But like The Force Awakens before it, the movie gets better the more it deviates from past triumphs. Unlike Awakens, which slid into Star Wars cliché as it went, this standalone story struggles through a slightly uneven middle section but ends on a high, with a triumphant third act set on the tropical planet of Scarif.